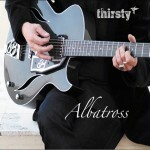 Share the post "Album review: THIRSTY – Albatross"
A fine extension to 2015’s self-titled debut album, ‘Albatross’ finds Thirsty exactly as we left them. With 11 tracks coming in at bang on 33 minutes, the band are sticking to their formula of great songs in or around the 3 minute mark and this keeps the album feeling fresh and easy to listen to. As with its predecessor the album has a good earthy mix of ‘60’s influences- whether that be Stax, The Rolling Stones or, even at times the likes of Dylan and The Small Faces. Album opener ‘The Albatross’ is one of the best things I have heard all year and is very reminiscent of Keith Richards, as is ‘Orlando’ with its lovely warm Keef like vibe and ‘Chaos’ has a tight but loose feel that sums up Thirsty perfectly. Throughout his career songwriter and guitarist Guy Bailey has been consistently solid and ‘Albatross’ is no different, his playing blending perfectly with the keyboards of Chris Johnstone. As with the band’s debut, this album has been produced by Chris KImsey and he has expertly captured the feel of the band. Writing again with Russian poet Irina D, some of the songs take influence from literary works by writers such as Virginia Woolf, John Bunyan and Samuel Taylor Coleridge and this sits nicely alongside the musical influences throughout the album. ‘Shore of Light’ is another of the best songs of this year, the ballad like ‘Beat Of Her Heart’ has a Dylan meets Richards feel, whilst ‘Say It Isn’t So Joe’ has a Small Faces like intro. Album closer ‘Patriotic Little Trash’ has a touch of Stax about it and ”Cosmic Aphrodite’ has a more prominent female vocal but the great thing with this album is that it is hard to single out the highlights here. This entry was posted in ALBUM REVIEWS, ALBUM REVIEWS (Mobile), All Posts and tagged Albatross, album, Chris Kimsey, Guy Bailey, Irina D, poetry, Quireboys, review, rock, Rolling Stones, songwriter, Thirsty. Bookmark the permalink.